Do you have an interest in crochet? Extreme ironing? Wearing only green shoes? There is probably a social networking community out there for you so you can connect with like-minded people who share your interests. 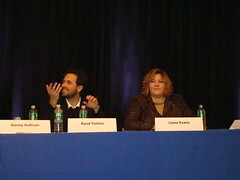 At SMX Social Media this afternoon Rand Fishkin and Liana Evans both spoke on how to find, use and leverage these smaller social networking communities. To find these micro communities in your vertical, you can check out the web 2.0 lists of social media lists, search for topic relevance and coverage in a search engine and read the social media discovery blogs. The long tail of social networking sites and micro communities is very, very long. You will be able to find a targeted micro community focused on what your interest is. So what does this mean from a marketing standpoint? How do you promote your company focusing only on puppet eyebrow manufacturing? To generate buzz among your targeted group, join a community focused on your industry or product offerings and see what kinds of knowledge you can gain and ideas you can come up with. The people in this interest group know what they like and donâ€™t like, and you can benefit from that. In your specific vertical, these social networking sites are just like all other social networking sites, except that instead of millions and millions of users, they would only have thousands. But this can be a good thing. Who wants 5 million visits to your website on orange fuzzy socks from people who have no interest in that? It can be much better to get 7 visits from people who absolutely love orange fuzzy socks. These micro communities have huge brand-building potential. You arenâ€™t looking for customers directly through these micro communities. You are looking for ways to establish your brand in the social networking world and to promote that brand through like-minded individuals who maybe write their own blogs on orange fuzzy socks and who take professional photos of their sock collection. These people will end up being more influential. And they are most likely connected to other like-minded individuals in the marketing mix, so the connections you could create in these social networking sites can increase your sales over time. So no matter how bizarre your interest is, or how strange your companyâ€™s product focus is, you can probably find a social networking community around this topic. Just do some research to find it, and then use the social networking rules Iâ€™ve outlined throughout the conference, and you can become a well-respected and influential user who sees impact from social media. Just remember: when it comes to orange fuzzy socks, you are not alone!